Security in banks is paramount across a range of applications. Banks use ID cards and passes to ensure access is controlled to its premises while Bank Cheques and Bank Drafts are vulnerable to fraud with appropriate Optical Security Devices & security print. 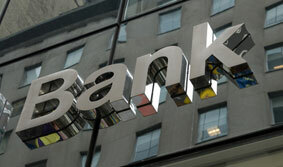 Security Foiling offers Identity-SECURE and Cheque-SECURE solutions to the banking industry.